Fidelity Shield Insurance Company (hereinafter referred to as ‘FSIC’) values its client’s privacy, and this policy contains terms and conditions that govern confidentiality in relation to information shared FSIC’s customers . •	Fidelity Shield Insurance is the sole owner of all information collected on this site, which information is not available for sale/rent by third parties without express written consent of FSIC. •	Some pages of this website may require Fidelity Shield Insurance to collect information from end users, which FSIC may transfer collected information to any relevant unit within Fidelity Shield Insurance, anywhere in the world. •	If an end user contacts Fidelity Shield Insurance with a general inquiry, the end user may need to provide us with personal information. •	Fidelity Shield Insurance will then use this personal information to respond to the inquiry and track further correspondences. •	The information provided by end-end users may also be used to compile statistics on response handling. •	This information is generalized and no individual names or personal information are retained or used for any other purpose. •	If an end user wishes to subscribe to information about Fidelity Shield Insurance, such as press releases or financial reports, the end user will be asked to provide an email address to enable FSIC send the requested information only and not for any other unsolicited information. End users may subscribe or unsubscribe to information at any time by filling in the form on http://www.fidelityshield.com. •	From time to time, FSIC site may request information from end users via surveys or contests. Participation in these surveys or contests is voluntary. The end user therefore has a choice – whether or not to disclose this information. •	Information requested may include contact information (such as name and address) and demographic information (such as gender, age, level of education). •	Survey information will be used for purposes of monitoring or improving the use and satisfaction of this site. •	For contests, contact information will be used to register participants, notify the winners and award prizes, etc. •	FSIC may partner with another party to provide specific services. When the end user signs up for these services, FSIC will share names or other contact information that is necessary for the third party to provide these services. •	These third parties are however not allowed to use any personal information collected, except for the purpose of providing these services. •	FSIC does not share any aggregated demographic information with our partners and advertisers. FSIC website may contain links to other sites. Please take note that Fidelity Shield Insurance is not responsible for the privacy policies or practices of such other sites. We encourage our end users to be aware of the same when they leave our site and to read the privacy statements of each and every site that collects personally identifiable information. This privacy statement applies solely to information collected by this site. 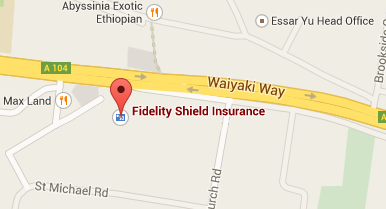 Fidelity Shield Insurance may, from time to time, make changes to this policy. FSIC shall endeavor to share with its end users an updated version of this policy whenever new amendments are effected.